Madison, since you brought up our favorite petite fashionista, thought I would add my own Nicole inspired post. Making her rounds on such hard hitting programs like E! News and Extra, there was a common theme that might go undetected to the sartorially untrained eye – slouchy, oversized trousers! Gasp! The black and white stripes belong to Balmain while the border printed version she wore on E! are from a brand called Clover Canyon. I spotted this line at a trade show 3 years ago in Vegas and distinctly remember sending pictures (illegally yes. I’m a rebel like that) to our sales team – the way they engineer their prints on flow-y soft woven fabrics and pitch them onto simple yet trend relevant shapes, appeal to boho girls everywhere! It is not surprising that the reigning queen of this effortless vibe would pick up on the label. 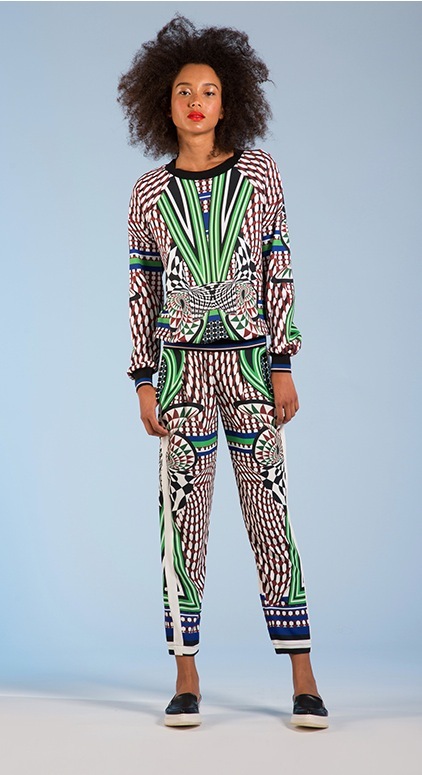 The Resort 2014 collection took a bit of a sportier turn compared to past deliveries – here are some of my personal favorites. Also experiencing my usual fro envy.